January 22, 2013 at 12:05a.m. A trip through the South a few years ago left an indelible imprint on Janae Ward — the same kind that she feels can change the world for the better. “We go as students and come home as activists,” said Ward, a Youngstown State University social-work and law major. She was referring to her 2009 participation in Sojourn to the Past, a 10-day, five-state traveling history course that allows high-school students to retrace the steps of the modern civil-rights movement of the 1950s and 1960s. Beginning in Atlanta and ending in Memphis, Tenn., they hear presentations from and meet key figures of the movement. 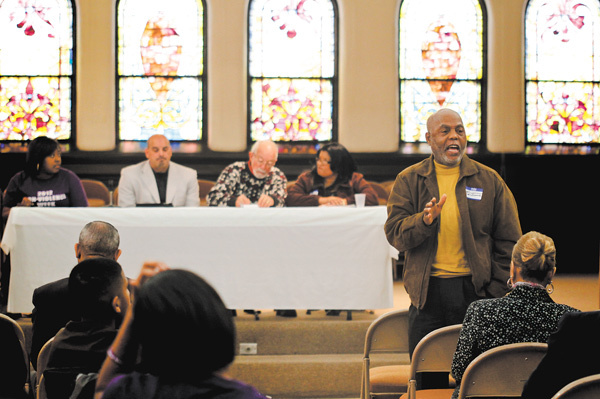 The Sojourn trip demonstrated to her the value of standing up for what’s right, confronting injustices and helping to develop action plans to better her community, said Ward, who also shared her experiences as a panelist during Monday’s 30th annual Community Workshop Celebrating the Life & Legacy of Dr. Martin Luther King Jr. gathering at First Presbyterian Church, 201 Wick Ave. The 2 Ω-hour event, themed “Eyes on the Prize: The Pursuit of Peace,” examined the history of racism and what many feel remains to be done toward realizing King’s dream while acknowledging the efforts of local grass-roots organizations dedicated to addressing the issues of peace, violence and social justice. A key civil-rights worker and Sojourn presenter who had a tremendous impact on Ward was the workshop’s main speaker, the Rev. James W. “Jimmy” Webb II, church planter for the Norfolk, Va.-based Shepherd’s House Ministries International. “Young people, if you see wrong, at least get mad about it, get upset about it and be bothered by it, even if you aren’t in a position to do something about it right away,” the Rev. Mr. Webb told an audience of about 70, adding that one person’s courage usually inspires others to act similarly. At age 16, Mr. Webb led a peaceful children’s march to the Dallas County Courthouse in Selma, Ala., and was met by an angry sheriff’s deputy named L.C. Crocker. Instead of fighting back, he calmly and nonviolently asked the deputy to pray with him. Crocker refused to pray with the young Webb or to allow him to enter the courthouse, but the confrontation ended with no violence. Calling the nation “a big bowl of vegetable soup,” Mr. Webb explained that, just as vegetables take on their own flavors, people can use their own gifts and talents to bring about positive change. “You don’t have to give up who you are to be in this big soup called America,” he added. Mr. Webb noted he feels that much of today’s racism is built on some white peoples’ fears about the country’s changing demographics and the prospects that whites could be in a minority in about 30 years. He concluded by urging young people to adopt a vision and a cause bigger than themselves. Other panelists were the Rev. Al Yanno, pastor of Metro Assembly of God church; the Rev. Jim Ray, a retired YSU campus minister; and retired detective/Sgt. Delphine Baldwin-Casey of the Youngstown Police Department. Facilitating the session was William “Guy” Burney, coordinator of the Community Initiative to Reduce Violence. Baldwin-Casey, who worked mostly with victims of domestic violence, noted the crime cuts across all economic, educational, religious, cultural, racial and generational lines. The Rev. Mr. Ray called for a local multiracial entity to look at ways to encourage people of different races to interact with one another more regularly. Making additional remarks were the Rev. William J. Blake, a member of the Martin Luther King Jr. planning committee; and the Rev. Kenneth L. Simon, pastor of New Bethel Baptist Church. Musical performances were from the Harambee Youth Organization. January 18, 2011 12:07 a.m.
Workshop celebrates life, legacy of Dr. Martin Luther King Jr.
February 25, 2017 8:33 p.m.